Merriam Webster defines a paradoxical situation as one that has seemingly contradictory qualities or phases. When reading this definition, I decided that paradoxical was the perfect way to describe Sat., April 14. As a few of my teammates and I gathered around the picnic table outside of the Missouri Cattlemen’s building, awaiting the announcement of the 2018-2019 Missouri FFA State Officer Team, we were sad. We were sad because just over 365 short days ago, we were in their seats. We were in this building, in these chairs, and even feeling these same emotions. Yet, even as I sat there with a little bit of bitterness, I couldn’t help myself from paradoxicallysmiling. Although I know that my journey in this FFA jacket is quickly coming to an end, I also know of the greatness that this new team possesses. I know that all 16 of its members have an undeniable passion for not only the blue and gold, but also for the entirety of the agriculture industry that we so proudly represent. I know that this team will serve our association with pride. I know that Adriene, Allie, Andi, Audrey, Chloe, Dillon, Hannah, Hattie, Madelyn, Madison, McKenzie, Paxton, Quentin, Regan, Ryan and Shelby are world changers. And, I can’t wait for FFA members to meet them. Aristotle once said, “We are what we repeatedly do. 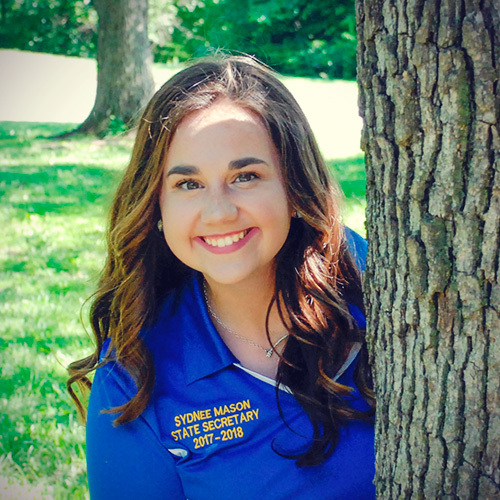 Greatness then, is not an act, but a habit.” To the future leaders of the Missouri FFA Association, let yourself be great, just like we know you will. 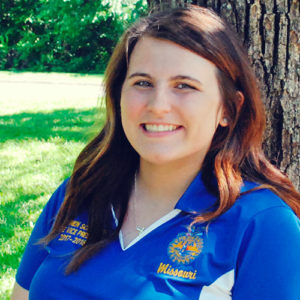 To the entire Missouri FFA Association, you have risenfar above expectations this past year. Keep working, keep learning and keep rising, because you posses greatness, and seeing that unfold is a special thing to be part of. 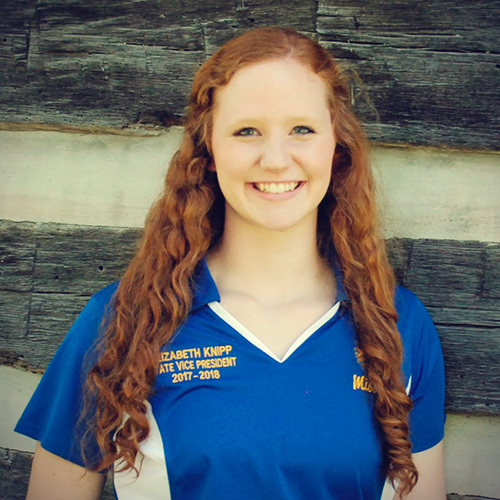 It is truly a paradox to wrap up my year as a state FFA officer. While I am oh, so sad that my journey must end, I am thrilled to see what the future holds. It has been real, it has been fun, and it has been real fun, Missouri FFA. We all know how it feels to go to the movie theater — the anticipation of the trailers before the movie, the tasty popcorn, and of course the movie that is going to be seen. I love going to the theater and seeing the new movies that I find trailers for over the television. Recently, I saw the movie “The Greatest Showman.” The movie shares the differences among a group of individuals in a circus act. Throughout the movie, challenges are faced and later the cast must overcome obstacles each faces while performing. In the end, the entire cast all come out successful as a team and create the greatest show known to man. I absolutely fell in love with the concept of the movie! As I reflected later on what I had seen, I realized the film has so many different meanings. In fact, the movie really relates to the conclusion of our year in the FFA. State convention is just one month away in the Hearnes Center in Columbia, Missouri. 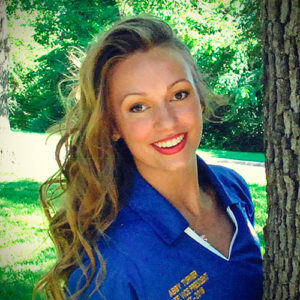 As FFA members, convention is our greatest show. It’s our time to show off what we have been working on for the year. Just like the characters in the movie being different in their own way, we are also each different. We all bring a unique and different skill set to our contest teams, speeches and especially our FFA chapters. The 90th Missouri FFA Convention is where we make up the greatest show. Together, we will all make up the greatest show of the year. I challenge you all to bring your best to the convention to make your team, chapter and state proud! It’s that time of year again; the days are getting longer, the sun’s shining a little brighter, and we can finally spend some time outside. It also probably seems like all of your classes are taking forever. And if you’re anything like me, you might be starting to spend more and more time daydreaming and looking out the window at the green grass and warm sunlight. I know that right now it feels like the end of school is so far away, but I promise it really is just right around the corner. You see, I always found that it was hard to focus on school in the spring because I put my attention on the next FFA Career Development Event contest coming up. I remember spending hours studying and practicing reasons and how good it felt when all that preparation finally paid off. I know that at times it might feel like the contest team you are on doesn’t apply to you or won’t help you out in the future. However, those skills you learn in a contest will stick with you for the rest of your life. 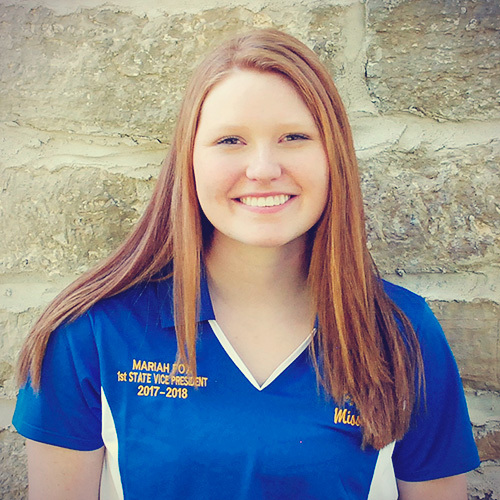 Livestock judging helped me so much with personal development skills, learning how to speak to a judge and how to convey a clear and understandable message. Evaluating the livestock taught me to assess a situation from all angles and to make sure I check all the key points. It taught me how to look at something as an individual and how to compare two things together, and how to pick out the important standouts in a group of individuals. 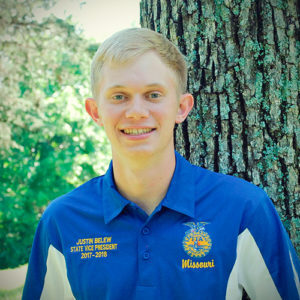 Livestock judging makes a difference for me in my everyday life, and those skills I learned have helped me out in many situations such as in job interviews and in the college classroom. I use critical thinking and communication skills every single day, whether or not I am working with livestock on that given day. FFA members, if you will commit to your contest team, give it your best and make the time to invest in your content, you will walk away with much more than just knowledge about that specific subjuect. Instead, you will walk away with practical tools that you can use in your everyday life, and that will help make you into the leader you are meant to be. Being a member of the Catholic church, one of the biggest events after the start of the new year is the beginning of the season of Lent. Members of the Catholic faith decide what they are giving up and what they are going to do better. When I was in high school, the beginning of Lent also had another strong meaning for me. When Lent began, that meant it was almost time for the annual Missouri FFA State Convention. The convention was the highlight of my year. Not only was I competing while in attendance, but I was also seeing old friends and making more memories in the blue jacket. With the convention upon us, I want to give all of you FFA members three pieces of advice that I have found valuable over the years. First, get involved. There are so many activities at convention. Go to the career show, watch a session or even play a pre-convention game, but be involved at convention! Second, do your best. Many of you have been prepping for convention for several months either on a Leadership Development Event, Career Development Event or in a proficiency area. When at the convention, do your best all the time. Show others that you put the time and effort into making your convention successful! Finally, the third piece of advice is have fun! Convention happens only once each year. That’s why you must make the most of it while you’re there. Make new friends, compete against other FFA members and enjoy your time in the blue jacket. Just like me, others experiencing the season of Lent challenged to do something better. 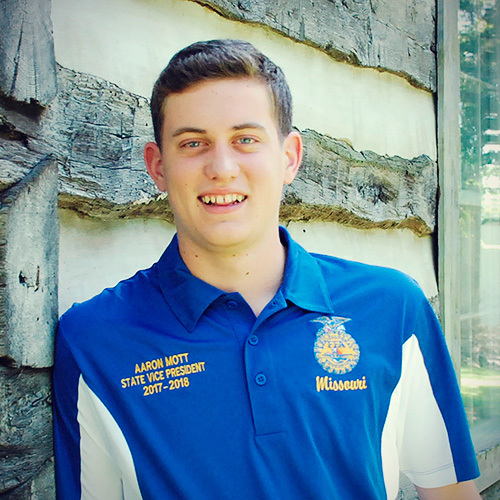 Now FFA members, I challenge all of you to use these three pieces of advice while attending the up-coming state FFA convention and make the most of your time there. Convention is only two short months away! 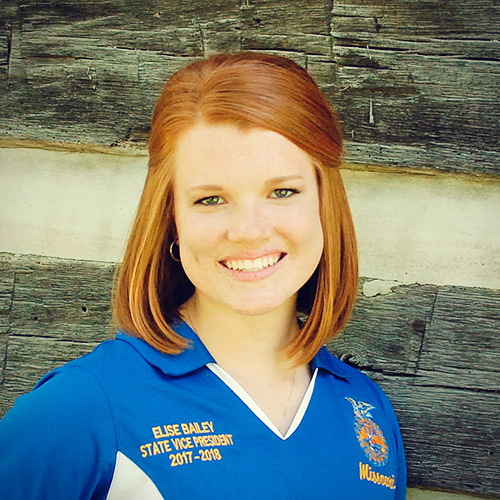 What are you going to do to make the most of the 90th Missouri FFA State Convention? There’s only one game where players rival head-to-head, plan epic tactics and encode hidden obstacles: BATTLESHIP. This game is like no other and causes my sisters to go into complete competitive mode. As I sat on my grandma’s living room floor and watched a game unfold, I saw that Rosalee and Clara were in the midst of a classic heated battle as they maneuvered to try and outwit each other. Rosalee looked up, smiled, and said again, “I won!” — proceeding with a firm “NO, you did not! !” from her irritated middle sister. Clara finally understood what Rosalee meant, and everything became clear. She was no longer angry nor argued with Rosalee and resumed to play the game as she marked the ‘I one’ spot with her peg. Oftentimes, these simple communication errors happen in our daily lives. Some are small, while others have damaging consequences. We think we are effectively communicating, when in reality our message is fuzzy, complicated and misunderstood. With the hustle and bustle of the spring semester — career development events, scholarship application deadlines and weather cancellations — the need for clear communication is essential. Every day, we need to be conscious of how we communicate to ensure we are relaying the correct message for others to hear. When I was a little girl, one of my favorite things to do was listen to my dad tell stories. I would sit cross-legged on the deep freezer in the corner of his meeting room and listen while he motivated and inspired college rodeo athletes from across the country. Not much has changed since those days — the stories are the same and the only differences are the athletes in his program. I still love to listen to these honest, tried and true tales. One of my favorites is the following old Cherokee legend: Two Wolves. Embracing the changes and endless possibilities that 2018 promises to bring might seem like a daunting task. Hopefully, we have all settled into those familiar routines of school, chores and homework by now, and we are ready to tackle whatever the second semester has in store. FFA members, let’s remember the wise words of the Cherokee grandfather. Whether we’re studying for a Career Development Event, memorizing our speeches for spring contest or simply investing ourselves in the Ag classroom, let’s pledge to feed the good wolf in 2018. January has arrived and so has the snow. When I look out my window at a field of freshly fallen snow, it makes me want to freeze that landscape in time. I know in a couple of days that this field will not have perfect untouched snow on the ground; instead footprints will market its perfectness. When I take a step in the unblemished snow, I quickly realize that every step I take will show. This image is a good reminder for us in life. The paths we make and the destinations that we reach are evident to those watching simply by the steps that we take. As I look back on my trek through the snow, it is clear to see not only the distance that I have traveled, but also where my journey began. Whether in our FFA careers, our educational adventures, or our journeys in life, this image holds a powerful meaning. It is important to be reminded that others are watching, and maybe even following, in the path that we’ve paved. At the end of the day, it is imperative that we look back on the lengths we have traveled and recognize the place where our journey commenced. The holidays are for spending time with friends, family and for those in production agriculture — for continually caring for our livestock as colder weather seeps into the landscape. This colder weather means our livestock will normally stick closer to the feed and water supply that becomes increasingly more necessary as lower temperatures set in. This is normally the case for my family’s small commercial beef cattle herd, but this year, one cow in particular decided to change things up. A mature and easy-going cow managed to find her way out of our pasture’s fence THREE times over Christmas Eve, Christmas day and the day after. It seemed that she was on a mission to discover every failure in the fence. At the time, it seemed extremely inconvenient to be fixing fence and dealing with a loose cow around Christmas. However, when looking back on the experience, I began to reevaluate the situation. Many times, whether in FFA or in life, we will encounter failures just like that cow found the failures in the fence. Instead of focusing on the negative effects, it is just as important to keep a positive attitude and look for the opportunity to grow. Although it was stressful to safely re-secure the cow, we were able to fix the fence before a larger problem could have occurred. Without a doubt, we will make mistakes in our lives, but it is how we react and learn from our mistakes that allow us to improve. Remember, the next time a failure strikes us down, look on the up side, there might be more hidden benefits than we realize. American industrialist Henry Ford once said, “Failure is the opportunity to begin again more intelligently.” This concept is one that surrounds us all as FFA members. From the early days crafting our Supervised Agricultural Experience programs to the late nights finishing our State FFA Degree applications, failure exists. Failure is prevalent, and quite frankly, it is often one of the hardest things we face as members of this organization. Although it can be hard to look failure in the eyes, a graceful comeback from a major setback can teach us some of the best lessons, even better than the ones we learn when we win. So, how in the world can we turn our greatest losses, biggest challenges and most triumphant failures into successes — into life lessons — and into our most joyful wins? 1. Take a deep breath. In the wise words of famous author C.S. Lewis, “There are far, far better things ahead than any we leave behind.” It is unexplainably hard to fall short of your own or others’ expectations. However, if you take a step back and put your life into perspective, there is always more to come. Make a list. What did you do? What was wrong with it? What would have made you successful, rather than a failure? How can you change your actions, moving forward? According to American economist, Leonard Schlesinger, “Failure doesn’t mean the game is over, it means try again with experience.” This is your opportunity to gather your thoughts in a reflective way and use them to craft a second attempt. Try, try again. Take another chance. Give it another go. Looking to the words of Maya Angelou, “you may encounter many defeats, but you must not be defeated.” Using the knowledge you gained in steps one and two, make another attempt. This is your chance to turn things around. Reflect some more. What went differently the second time around? How did you improve? What changes did you make, and how did these changes impact the outcome? Repeat! This cycle is not fool proof. Even with reflection, planning and action, there will continue to be failures, short-comings and disappointments. However ,with the right mindset, you will begin to use these failures to build successes, to learn from your mistakes and to turn these losses into wins. As the future of agriculture, you will face hardships. This journey will not always be easy, and failure will always exist. However, if we use our failures to build successes, we will always be winners. Looking back on my first semester of college, one class period of Ag Ed Leadership weighs on my mind. Dr. Tummons had yet another great lesson for our class. He held up his daughter’s painting from elementary school. The painting featured a vast array of vivid colors. It was a woman with bright red hair, a blue top, a purple mountain behind her, and it featured a large yellow-orange sun peeking through the background. Dr. Tummons told us he was going to recreate her painting and needed us to shout out the colors we saw. The class yelled out the colors blue, red, orange, yellow, green and purple. He poured some of each color onto a pallet and started with the red paint. However, instead of using the red paint on his brush to begin painting, he put it in the blue paint next to it. He continued to mix all the colors together until they made a dull light brown. He then casually began recreating the painting starting with the woman and finishing with the sun peaking out behind the mountains. Then, Dr. Tummons turned, to what I can only assume to be a class full of confused faces, and asked which painting we thought was more beautiful. His daughter’s with the array of colors or his that was all dull brown. We answered obviously the one with all the beautiful colors. The paintings were a representation of life, and the colors represented people. Life is beautiful and interesting because we are different and bring a unique color to the painting. If we were exactly like everyone else, our picture would be painted with the same color. All the shapes would remain, but the eye-catching appeal of an intricate and beautiful color scheme would be lost. As the school year continues, stay connected to your own vibrant color. Do not be afraid to be yourself and strive to become the best version of you. As tempting as it might be to want to become like another person, the world really needs more you. Like Dr. Seuss said, “Today you are you! That is truer than true! There is no one alive who is you-er than you!” Let’s all use our individual colors so that together we will create a masterpiece! FFA members, are you ready to rise to the challenge?